But the truth is, I'm no tea snob. It doesn't have to be teapot tea. Teabag tea is fine. OK. Got that little one cleared up. But there's more. I crossed to an even darker place than that. I now drink decaffeinated tea. Decaffeinated. Teabag. Tea. I used to wonder at the whole decaf thing. If you are going to drink tea it may as well have the caffeine in it. (And how do they decaffeinate it anyway??) But I don't actually drink tea for the caffeine hit. I drink tea to have a warm drink. And alas, whereas once if I didn't fall asleep within three minutes of hitting the pillow I thought I had insomnia, in recent months sleep has been somewhat elusive. So I decided to drink decaf tea during the evening to see if that made a difference. And having got used to it, I find myself drinking it most of the time now when I'm at home. My sleep is good again. The tea in its decaf rendering is fine. And I'm not a tea snob. Although I still prefer to drink it from a reasonably fine cup or mug. Chunky cups just won't do. That's all. It's a cheat because it only takes 30 minutes to make. Best ever because it is the best ever. I cook lots of this every winter. Thought I should share it with you. 1. Heat the oil in a pot and saute the onions and garlic for a couple of minutes until soft. 2. Throw in the carrots, celery, capsicum and cauli and saute for a couple of minutes to start the cooking process. 3. Add the passata (a big tin of crushed tomatoes works as well), stock, basil and pasta and simmer until the pasta and veg are tender - about fifteen minutes. 4. Add the kidney beans in the last five minutes - just long enough to heat them up really. Season with salt and pepper as needed - will depend upon the stock. 5. Seve with parmesan cheese and a bit more fresh basil. No one will ever know it only took half an hour. How many serves? I figure that each cup of stock, along with all the other good things, equates to one adult serving. This recipe doubles easily if you need a larger volume of soup and have a big cooking pot. If you need to say that this recipe isn't vegetarian (does chicken stock help it to cross that line?) then frying some bacon or salami with the onion and garlic works well, adds nice saltiness and will cover that base. 1. Start from 1st January (on 1st July - and it is OK to do this...really it is) and use this plan to get you through the lion's share of Old Testament history, all of the Psalms and all of the New Testament. 2. Start from 1st July and use this plan to get you through the tail end of Old Testament history and all of the wisdom literature and prophets, the Psalms and the New Testament. Options one and two have you reading three or four chapters a day. 3. Use either half (January to June or July to December) to get through one part of the Bible if working in three sections is too difficult. Maybe Psalms or New Testament. 4. Go here for other reading plans to start from the beginning or from the middle. Having finished my tour of the prophets for now, I have decided to embark upon a slightly ambitious project of doing a read through of the Bible in chronological order. Ambitious because I am going to try to get through it in six months which means double readings each day. Ambitious because the second half of the year contains those particularly busy months of November and December. And if I don't make it then that will be OK. But I'm going to try. HEALTH WARNING: If you are new to Bible reading or in a floundering patch, don't be overwhelmed by my overambitiousness. Anyone who has read this blog for more than three minutes will know that I think reading the Bible is pretty important and pretty wonderful but I have floundered too. Pick what works. But pick something because it is a valuable and wonderful use of your time. And if you don't need to reboot, then as you were. Press on. What are you reading at the moment and how do you plan your reading? How many Christians live their lives packed up and ready to go? There is no mystery about it; common sense should tell us. Be wholly committed to Christ's service every day. Don't touch sin with a barge-pole. Keep short accounts with God. Think of each hour as God's gift to you, to make the most and best of. Plan your life, budgeting for seventy years (Ps. 90:10), and understanding that if your time proves shorter that will not be unfair deprivation but rapid promotion. Never let the good, or the not-so-good, crowd out the best, and cheerfully forgo what is not the best for the sake of what is. Live in the present; gratefully enjoy its pleasures and work through its pains with God, knowing that both the pleasures and the pains are steps on the journey home. Open all your life to the Lord Jesus and spend time consciously in His company, basking in and responding to His love. Say to yourself often that every day is one day nearer. Remember that, as George Whitefield said, man is immortal till his work is done (though God alone defines the work), and get on with what you know to be God's task for you here and now. 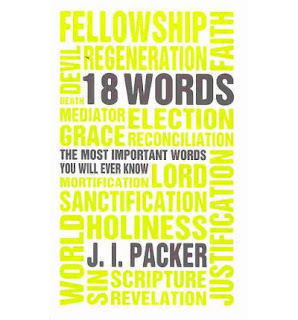 The very last page of 18 Words: The Most Important Words You Will Ever Know from the chapter called "Death" by my new friend JI Packer. So very encouraging. 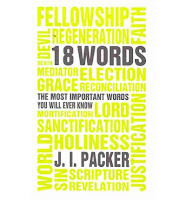 In his chapter on "The World" in 18 Words: The Most Important Words You Will Ever Know, JI Packer considers the different ways we might regard the world - physical, geographical, racial, anthropological, sociological, cultural...and even personal (think "welcome to my world.") And then there is the biblical view. The biblical idea of the world covers approximately the same area of meaning as our secular notions does. It likewise denotes this earth with its cosmic environment, and men upon it, or sometimes mankind alone. There are words both in Hebrew and Greek translated "world" in the English Bible, which mean simply "the habitable (or inhabited) earth." Yet the standpoint from which the Bible speaks of "the world" is quite different from ours. For in the Bible "world" is a theological word - a word, that is , which is defined in terms of God. "The world" is always, and emphatically God's world - the order of things which He made, which He owns, and which He rules, despite all His creatures' efforts to cast off His sway. The reference-point of the biblical idea of the word therefore, is not man, but God. What we have to do now is to learn to think of the world God-centredly, as the Bible presents it - not always as it appears to human inspection, but as God sees it, and thinks of it. For the thoughts of God about it are the measure of what it really is. 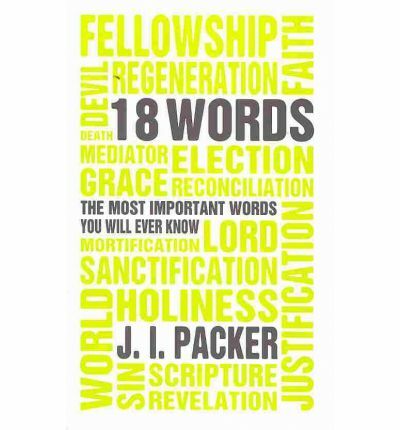 From 18 Words: The Most Important Words You Will Ever Know by JI Packer chapter four, page 55-56. A helpful reminder that the world doesn't revolve around us. We bless thee for the words of salvation. How important, suitable, encouraging are the doctrines, promises, and invitations of the gospel of peace! blind: but we find he has treasures of wisdom and knowledge. We thank thee for thy unspeakable gift. his cross inflame us with ardour. And may every place and company we are in be benefitted by us. This is a prayer from The Valley of Vision. I have blogged an excerpt from it once before but this is it in its entirety. It's from the prayers at the back of the book - a series of set prayers for morning and evening. This one is the prayer for the sixth morning of the week. But it is the prayer that I find myself praying almost every day, not just on the sixth morning of the week. It provides me with a picture of the True God. It shows me the true me. It shows me what God has done for me in Jesus. And it shows what is good for me to do, day by day, in light of all of these things. Hour by hour, what I need to recall in this equation changes - and I find different parts of this prayer coming to mind, as circumstances warrant. The other prayers for the rest of the week, morning and evening, are excellent too. But for months now, this one has been my everyday prayer.